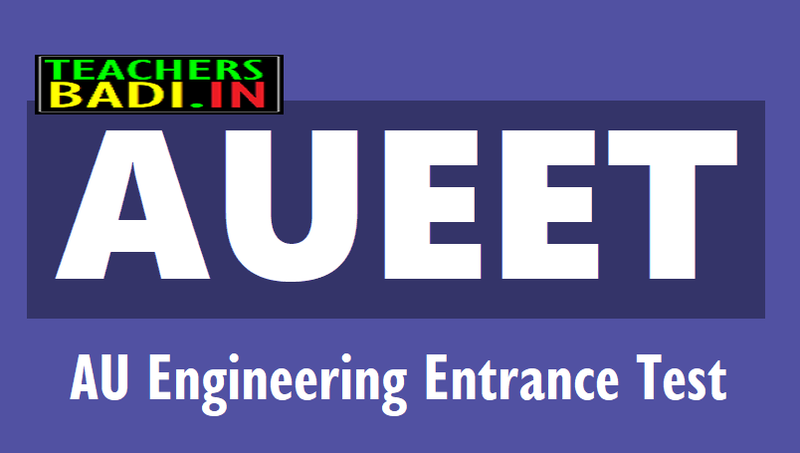 AUEET 2019 -AUEET 2019 AU Engineering Entrance Test 2019 Notification, AUEET(Andhra University Engineering Entrance Test) 2019 Notification: AUEET 2019 is a common entrance as Engineering Entrance Test (AUEET-2019). This test will be conducted by the Convenor, AUEET 2019, Directorate of Admissions Department, Andhra University for the academic year 2019-2020. Andhra University, Visakhapatnam invites applications for admissions into (A) 6-Year (B.Tech. + M.Tech.) Integrated Degree Programmes in CSSE, Computer Science & Networking, Civil, Mechanical, EEE, ECE, Chemical, Instrumentation Technology and (B) Twinning Programmes (B.Engg. Aircraft Engg and B.Tech. Electro Mechanical/ Chemical/ Electronics) through AUEET 2019. #AUEET 2019: Applications open for dual BTech-MTech degree. Andhra University, Vishakhapatnam, released a notification inviting applications for AUEET 2019 for a six-year integrated dual degree program. The course would contain the joint syllabus of Bachelors in Technology (BTech) and Masters in Technology (MTech). The course would include subjects like CSSE, Computer Science, Networking, Civil, Mechanical, EEE, ECE, Chemical and Instrumentation Technology. Candidates will also have the option to exit the course after completion of four years. AUEET 2019: Andhra University, Visakhapatnam invites applications for admissions into 6-Year B.Tech. + M.Tech. Dual Degree Programmes in CSE, Civil, Mechanical, EEE, ECE, Chemical, Instrumentation Technology (with exit option after 4 years) through AUEET 2019. Application Fee: Registration and Processing Fee of Rs.1200 (Rs.1000 for SC/ ST/ PHC) may be paid through Andhra Bank(billdesk)/ Payment Gateway(credit/ debit card). Andhra University has released the Andhra University Engineering Entrance Test (AUEET) for admissions into 6-year integrated dual courses in several engineering branches. The submission of online applications will commence on March 15. The applications will be received online till April 15 without any late fee and from April 16 to April 25 with a late fee of Rs. 1000 (Rs 1,500 for AUEET). The notifications are available at www.andhrauniversity.edu.in/doa and www.audoa.in. The courses, fee structure and admission information brochure are available in these websites. The aspirants can download the hall tickets from April 28. The exams will commence from May 5. The results will be likely announced on May 15 and the admission process will start from May 25. 5-Year Integrated Dual Degree Programmes B.Tech.+M.Tech./ M.B.A. courses in CSSE, Computer Science & Networking, Civil, Mechanical, EEE, ECE, Chemical, Instrumentation Technology and Twining Programmes (B.Engg. Aircraft Engg and B.Tech. Electro Mechanical/ Chemical/Electronics through AUEET-2019. Last date for submission(with late fee of Rs.1500): 25.04.2019. The detailed information is available on the websites: www.audoa.in and www.andhrauniversity.edu.in/doa.